Our Halloween 2017 stores are ready for you! This Saturday, September 16, we are holding the first of our weekly themed events. Let’s Celebrate Life. Halloween Style! The first 100 customers into each store will receive a free mini jumping spider to scare your friends with. Or maybe love and cherish it as your new pet. We won’t judge! 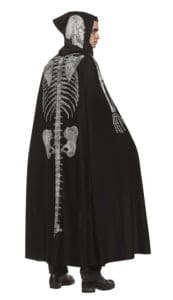 One lucky person will win a $100 gift certificate AND this super stylish skeleton cape. Come into store on Saturday, get your free jumping spider, enter to win a $100 gift certificate and skeleton cape, and you’ll have a great head start for Halloween! You can just spend the rest of the time until Halloween decorating your house, organizing your Halloween party and planning your Halloween costume lineup. Need help with spookifying your home? Here’s 10 of our favourite house decoration ideas to get you started. We hope to see you in your local Halloween store this Saturday. Don’t forget to arrive early to receive your free jumping spider!